When the Arakan Rohingya Solidarity Army (ARSA) launched attacks against military and police outposts in Myanmar’s northern Rakhine State on August 25, the fifth session of the Union parliament was about to go into recess. Minister of Home Affairs Lt-Gen. Kyaw Swe and his deputy, Maj-Gen. Aung Soe, quickly provided details about the response of the armed forces and police to lawmakers in both parliamentary houses, which have been controlled by the National League for Democracy since the 2015 elections. They explained at length how the country’s constitution and laws, particularly the counter-terrorism legislation passed in 2014, governed the actions of the security forces. The military-appointed lawmakers seconded their report, stressing the commitment of the armed forces, or Tatmadaw, to protect the nation and safeguard its territorial integrity. Little was said, however, about the brutal operations that subsequently triggered the exodus of more than 650,000 refugees into neighbouring Bangladesh. The regular session then adjourned on August 31 and no extraordinary session was convened in response to the crisis. No state of emergency was declared either. Instead, the Union legislature simply went into a six-week recess, reconvening on October 17 for its sixth plenary session. Parliaments in mature democracies are key to the prevention and management of crises. On top of considering rules and procedures to prevent or cope with conflicts, whether domestic or international, strong legislatures are likely to play a significant role in post-crisis investigations. This is at the heart of government accountability, an issue now being widely debated in Myanmar as the country attempts to move away from the unrestrained exercise of power and the top-down military autocratic model. But in fragile or nascent democracies, the legislative branch is often pushed aside by a powerful executive since its ability to influence the response to a major crisis and its aftermath is limited. Myanmar’s Union legislature, and even more the Rakhine State parliament, currently fall into this category. But this does not mean the legislative branch should remain on the side-lines. Ideally, the recent Rakhine crisis could be an opportunity for the Union parliament to strengthen its mechanisms of legislative oversight, particularly in the defense sector. Typically, when a security crisis emerges, and military and police forces are deployed to deal with it, a comprehensive review of all operations is carried out afterwards by national lawmakers. In exercising this scrutiny function, legislatures attempt to keep those holding the monopoly of legitimate violence within legal bounds. If Myanmar’s ruling NLD is concerned with alleged abuses of power by the country’s security forces, including paramilitary groups and civilian-led militias – as widely reported by much of the international community – the Union parliament is a legitimate place to start an inquiry. Both chambers have legislative committees that can examine alleged human rights violations and organize public hearings of security officials. The 2008 Constitution in its articles 115[b] and 147[b] also stipulates that defense and security parliamentary committees can be formed in each house to discuss related issues. There are, however, several difficulties with this normative ideal vision of the role and impact of Myanmar’s emerging legislative branch. First, several precedents indicate that the legislature is still not considered mature enough by Myanmar’s policy elites. Soon after the first attacks conducted by ARSA in October 2016, a 13-member investigation commission was formed by the government, not the legislature. Headed by Vice President Myint Swe, the commission, which released its final report in early August, dismissed reports of misbehavior by the security forces during its crackdown in late 2016. The latest initiatives by Aung San Suu Kyi to restore peace in Rakhine State, including the creation of a special committee to oversee reconstruction and development of the state, made no mention of the legislature besides mere budget approvals (nonetheless a crucial prerogative for Myanmar’s nascent legislative branch). Instead, Myanmar’s de facto leader urged the Union government, the private sector, local NGOs, the public and the international community to cooperate and work together for the region’s rehabilitation. On the issue of investigating abuses, the Tatmadaw normally conducts its own internal probes. Following the ARSA attacks in August, the commander-in-chief Senior General Min Aung Hlaing ordered the Inspector General of the Defence Services, Lt-Gen. Aye Win, to lead an inquiry into the behavior of his troops in Rakhine State. The findings, recently released and welcomed internationally with a high dose of scepticism, denied any excessive use of force or blatant abuses of power. Earlier in February, the leadership of the police and armed forces also initiated two parallel investigations into the death of Rohingya prisoners in custody and a video showing police officers brutally beating handcuffed men. The investigation led to the demotion and imprisonment of six officers and privates. Other internal inquiries carried out by the Tatmadaw have led to recent actions against its own “black sheep” in other conflict areas, especially in northern Kachin State. But these initiatives are rare and the sentences or demotion of officers seldom made public. The message from this is that Myanmar’s top administrators and executive officials on both the military and civilian sides tend to internally manage and review all aspects of security and political crises. 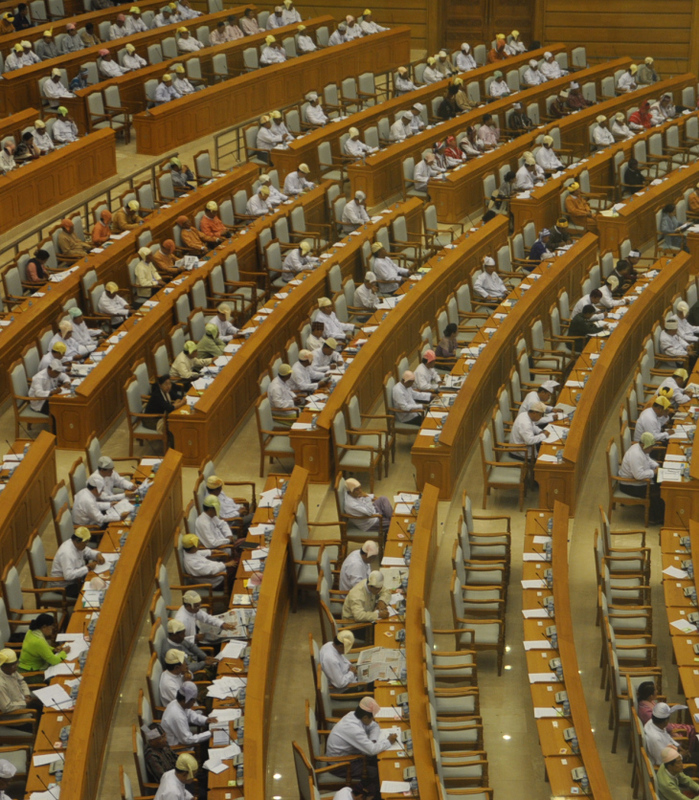 To examine issues of concern, the formation of committees and subcommittees has long been the tool of choice among Myanmar’s postcolonial elites. Comprised of respected leaders, these panels are created after each crisis, and deal with each of Myanmar’s “16,000 problems”, as former Prime Minister U Nu once joked. But if they sometimes include elected lawmakers, these ad hoc committees and commissions seldom, if ever, involve national or local legislatures as a body. Second, Myanmar’s parliamentary speakers have proven reluctant to engage the national legislature in public debates that would not only highlight obvious failures and damaging missteps made by the ruling party, but also put parliament in a vulnerable position in relation to other state institutions, the government and armed forces in particular. 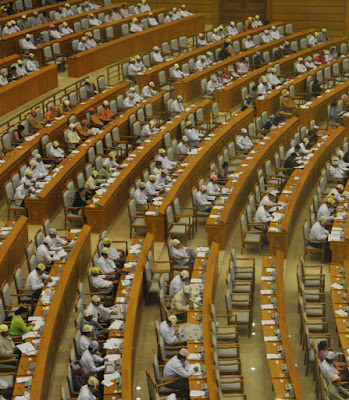 If, and when discussions of Rakhine issues take place in committee or upcoming daily plenary sessions, speakers of both chambers may well restrict debates and give priority to other legislative issues. Presiding officers have considerable powers and can block discussion of individual motions and parliamentary questions deemed unsuitable or untimely. Lawmakers in the current parliament have been repeatedly and strongly advised not to ask questions or table motions that would make the government look inefficient or create parliamentary discord. And in fact, Rakhine events have not much been debated during plenary sessions in both chambers during the Union parliament’s sixth session (October-November 2017) – much to the displeasure of the Arakan National Party, the main Rakhine nationalist force in parliament. Moreover, there has been a remarkable convergence of views in Myanmar on Rakhine-related issues. A majority of lawmakers believe that the Rakhine region and Myanmar have long been destabilized by illegal immigration from Bangladesh and are increasingly threatened by “rampant Islamization.” Reports of violence against the Rohingya community and human rights violations are routinely dismissed by backbenchers regardless of their party affiliation, ethnic background and geographical origins, as disinformation or propaganda spread by foreign groups ignorant of the country’s realities. Despite its institutional and potential prerogatives, it is doubtful that the NLD-controlled parliament will lead a review of what has happened, and how, in Rakhine State. This could hinder already valuable efforts by the legislative branch to emerge as a central power for ensuring government accountability. In a society dominated by paternalistic conduct and executive dominance, an assertive representative assembly ready to scrutinize every aspect of government activity would help shape a more balanced framework promoting the vital separation of powers. An impartial and professional legislative inquiry on the conduct and activities of the defence sector would also be key to the establishment of healthier civil-military relations in the country. Renaud Egreteau, a political scientist, is the author of “Parliamentary Development in Myanmar: An Overview of the Union Legislature, 2011-2016”, a report recently sponsored by the Asia Foundation and available here.